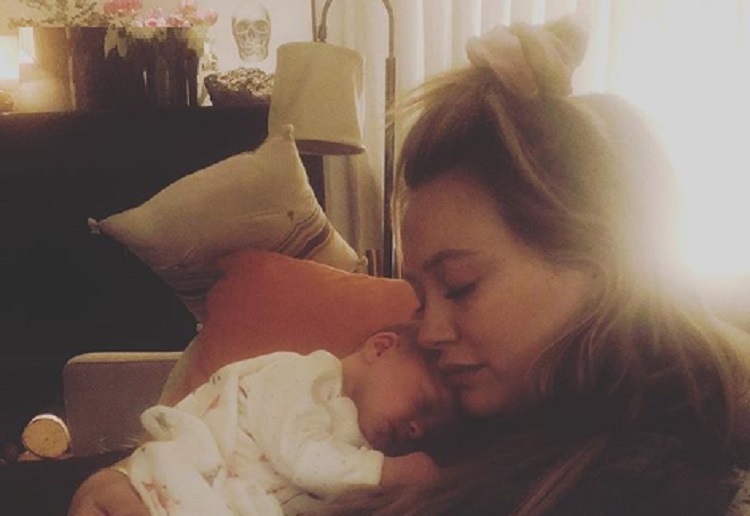 Hilary Duff recently revealed to fans that she’d called in a baby sleep expert to save her sanity – she never expected such judgy responses! Hilary excitedly shared on Instagram, “We have a sleeping baby! “Baby whisperer/ genius/ brilliant /calm and loving Kimberly (actually baby care specialist and postpartum doula) spent this rainy weekend with us and got our sweet girl sleeping! “The poor thing was running on adrenaline… literally not sleeping unless she had a warm human to sleep on and even then 30-40 minutes max! “Not realistic for our lives with going back to work and another child! Babies NEED sleep and our little girl is the happiest I have ever seen her! “She slayed 11 hours last night and woke up with the biggest gummy smile I have ever seen! “She has the tools to fall asleep on her own and it was so amazing (and a little emotional) to watch. People were quick to turn on the mum and get all nasty like usual telling her she was awful for sleep training her baby so young. – “I would never force an infant to be ‘trained’ for my convenience over biology,” another shared. – “Wouldn’t it be nice if we all had money like celebrities to hire people like this for ‘much needed sleep’,” wrote another. Each to their own I say! Just support mums, don’t tear them down for doing what is best for THEM. Are you kidding me?! She’s being judged for getting help with her baby to get it to sleep?! Mums know how draining lack of sleep becomes, how can they sit in judgement on someone who seeks help for it?? Sleep training may not mean what you think. We had to sleep train my 9 month old after she hadn’t slept more than 20 mins at a time for 9 months! We went to a facility, I was with her constantly and we didn’t cry it out – I’m not into that. We trained her to be comfortable in the cot without being on me. Then we trained her to be comfortable with my not patting her to sleep. She was “trained” in a few days and was a much happier, less stressed baby and I was also a much happier and less stressed mum. I don’t understand sleep training at all. My son woke every 50 minutes for 8 months and it never crossed my mind to sleep train. Sleep training can mean a lot of different things. I dont think anyone can comment without knowing the methods. I survived 1 year of frequent wake ups and inconsolable crying through the night, I don’t like sleep training but I understand everyone has different tolerances. Sleep is so important for everyone ! We can all do with a little less judgement and more support with a new baby. Omg….so so cute, way to go Hillary. Every parent needs to do what is best for themselves and there baby. WOW! Cue the outrage. Babies do need to learn to sleep for their own health. Good on Hilary for seeking help. Her entire family will be all the better for it. Clearly those who are outraged have never had a difficult and non-sleeping baby. I wouldn’t recommend it to anyone! Everyone needs to back off kid is clearly fine I don’t know why they think their opinions matter if it’s not going to help keep it to yourself. If it works for the baby and for the Mum to me it’s a win/win situation. I would love to have had a sleep expert come as one of my children really struggled to sleep. You cant judge what others do because you never know she may have been suffering from lack of sleep herself. At least she sort professional help and it was fixed and everyone happy.